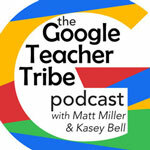 Matt and Kasey share ideas, sites, and tools other than those made by Google that plays nicely with Google for an enhanced teaching and learning experience. Padlet and Sites - gather feedback through an embedded Padlet wall, post, and share work, e-portfolios, add other media to Padlet wall to demonstrate learning without having to separately add pages, etc., Use as an embedded class blog, not perfect, but easier than using Sites alone. Wakelet and Drawings -- Create images in Drawings, add to a Wakelet collection with links, text, videos, etc. to share and for collaboration. Flipgrid and Slides/Sites/Docs - reflection, explain their answers, set goals and revisit, reflect on writing, book talk to go with their book report, reading responses explained. Adobe Spark and Slides/Sites -- Create images (Post), single-page web pages (Pages) and videos (Video) and embed/insert into Slides or Sites. Canva and Sites/Slides/Forms- (Just received a major update!) Create images for your projects and creations, restaurant menus into learning menus, blog post images, flyers, brochures, headers for your forms and sites, greeting cards. Kyle Anderson (Nevada) -- Keep and Forms in IEP process. A student with upcoming IEP: things have to do in Google Keep (date, send notices for parents, steps in writing it). Can use reminder function to set up in Calendar to notify when he has to complete steps. Forms: gather info for the process, send out a form to parent for details, to teachers to gather info on student, accommodations, to the student on info that will help them out best. Kasey - 15 Google Classroom Tips for Teacher BY TEACHERS!